After a lot of to-ing and fro-ing I decided that my soundcard needed a front end that would give even an Audio Precision credit! Well, that was easy. Now designing, building and testing it - that was far more work (and far more money!). But after more than a year, I am now at the stage that I have a fully functioning prototype, power supply, software and all. Update 15 Nov 2017 At the request of several users I compiled an overview of the control codes for the attenuation and gain settings.These can be tapped off for external use simply by extending the flat cable between the two boards. Change affects the value of C6, which should be 360pF instead of 510pF. All ordered and paid for units are send out, either directly to you or to Pilgham for assembly. Ward is making good progress, and I will coordinate with him on the calibration. I did build up two units on the new boards from the manufacturer and it seems that some of the cap values for calibration need to be adjusted; my hunch is that the PCB material (and maybe the parts) from this new source is slightly different in parasitics. Note that this does only affect the adjustment range to get the calibration correct. Capacitors C5 and C17 on the atten board (22pF) can be shorted or correct calibration (-48dB) but we are looking in recommending a new value that makes the adjustment a bit less sensitive. Capacitors C7 and C11 (22pF) on the atten board can be left out. Capacitors C6 and C10 (510pF) *may* need to be changed in value, will know in a few days. Again, this is only related to the cal range of the adjustments to null out board and parts parasitics. Finally, after spending a few days programming the controllers and packing the units, they are ready to be shipped from Germany starting next Monday. The gory details: You have the option to buy the 'half kit' as described here, but, as some have asked for, you can also get a complete build, tested and calibrated unit from Ward Maas at Pilgham Audio. Ward was at my place a few days ago and has picked up half a dozen units so he too is ready to go. Pricing: the half kit is, as announced, (the equivalent of) € 208 + shipping: Germany: € 7; European Union: € 17,90; Europe outside EU and Rest of the World: € 19,90. If you want a completely build, tested and calibrated unit, you have to order the kit from me but you don't pay shipping. I will forward your kit to Pilgham, and they will charge shipping at cost later. Assembly, testing and calibration will be € 224 which you will need to pay to Pilgham but this includes all parts on the User BOM (see attached). You can download the complete data package, everything you need to order parts, build it, calibrate it, use it, here. This might get updated due to comments so it would be wise to keep it in a folder where you can delete all of it and replace with an updated version. Thanks for your patience and helpful comments - these things always take more time than you think, but it turned out a nice unit and I am sure you'll appreciate it! Finally we're getting there! This week will be busy as I am receiving the last PCBs ​and will have do do a lot of packing etc. I expect to ship next week. I also arranged for someone here in Netherlands to assemble and calibrate units if anyone wants that. I will have the cost for that later after he assembles the first test case and I go with him through the cal procedure. This will be strictly between you and him without any (financial) involvement from me; I will just mail your unit to him and he takes it from there. I will give tech support of course when necessary. Everyone who has signed up for this will get a message requesting info the next few days. Let's get the show on the road! See attached pictures. Now you know why I insist on pre-mounted SMD, fully tested by the factory. Parts and units for kits start to flow in. I have received: all cases, mounting hardware, all SilentSwitchers, the front panel PCBs, and the microcontrollers to be programmed. Awaiting the main attenuator boards with the pre-mounted precision components. We're getting there! I have ordered the control & display PCB, and the attenuator PCB with the precision SMD components, expected to be delivered 1st week September. The SilentSwitcher supplies have been delivered, as well as the enclosures. We're getting there! - a SilentSwitcher power supply module for powering from a USB-charger or mains-free from a Powerbank. The price of this package is € 209. Shipping will be € 7 flat, tracked. To complete the unit, the through-hole parts need to be soldered to the two boards. These include the reed relays, the push-buttons, the LCD display, ultra-low leakage protection diodes, sockets for the opamps, the relay driver and the chips including the AD536, the voltage reference IC for the ADC, some assorted R's and C's. The complete unit needs to be assembled and some (limited) wire-up. A short 2*7 pin flatcable link needs to be fabricated to connect the two boards. Here are the BOMs for the through-hole parts that you would need to provide and solder to complete the unit. I have given Mouser or Digikey order codes, but you may have some of these parts already and/or get them cheaper. Just as a ballpark number, if you get them all from Mouser recon about € 100 total. Physically it will look as shown in the Youtube video. There are some additional functions not mentioned in the video. There are now two front-panel selectable nominal output levels (1V and 0.4V). The attenuation range is increased to -48dB max. to allow max 100VRMS input from your power amp with the lowest nominal (0.4V) output level. Also, in manual operation you can select 0dB, -16dB, -32dB and -48dB attenuation from the front panel, in addition to the HOLD button freezing the attenuation at the present setting for amplitude sweeping. All assembly guides, calibration procedures and parts lists will be available for download. I am now working on the Construction Guide. So, let me know at jandidden01@gmail.com if you are interested anyone; I am putting together a mailing list for the time when it is all completed. Finalised a firmware update which now allows you to switch between 1V and 0.4V nominal output level without opening the box. Instead of using a jumper it can now be selected from the front panel at switch-on. This will allow it´s optimal use both with soundcards that are most linear at 400mV Vin, and others that work best at around 1V Vin. That also required making the level calibration separate for the two nominal level settings, saving the level cal settings between sessions. Also, if you do only one calibration (for either the 1V or the 0.4V setting) the other is estimated (until you do a real cal for that). The introduction of the 0.4V nominal output setting option required increasing the max attenuation to -48dB to maintain the max 100VRMS input level (from the original -40dB). Manual settings on the front panel are now available for 0dB, -16dB, -32dB and -48dB. I am now cleaning up the display of the levels and inplemented an exponential averaging to get a more stable diplay (thanks to Mark Johnson). 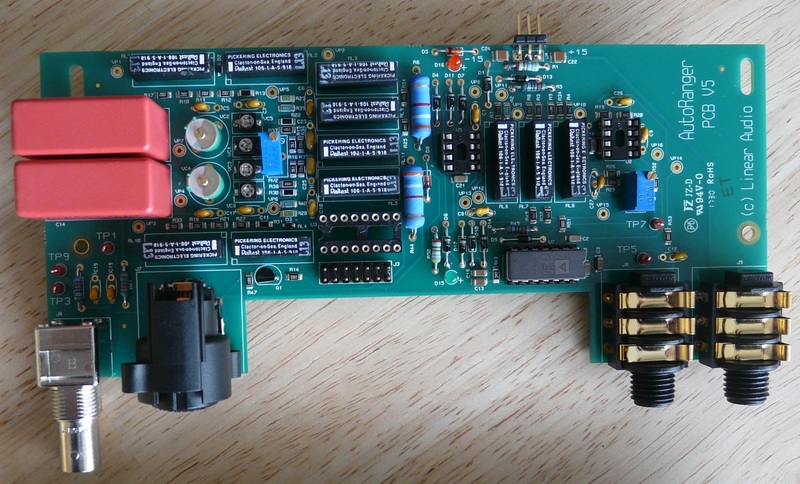 Then it is back to the manufacturer to update their quote due to PCB changes and a few extra components. January 2017: I have submitted two complete auto-rangers to trusted persons for beta-testing. A also have produced a preliminary User Guide which can be downloaded here to get a feel of how the unit operates. It also has some pictures of the physiacl unit, but be aware that the final PCB layout may still change; for instance, some parts that show as SMD will be changed to Through Hole. But the overall setup is pretty well fixed. Most of us use a soundcard and ARTA or similar software to test our amps and whatnot. But the soundcard has a 'sweet spot' at around 1V input level; go over that and the soundcard distortion goes up or it even can get damaged. So there is always a need for some rigged-up attenuator. irrtating! It also makes repeatability much more difficult, not to speak of varations in frequency response due to that makeshift attenuator. So, what the Autoranger (AR) does is take the signal from the amp you want to measure, and size it to around 1V for your soundcard. Automagically. 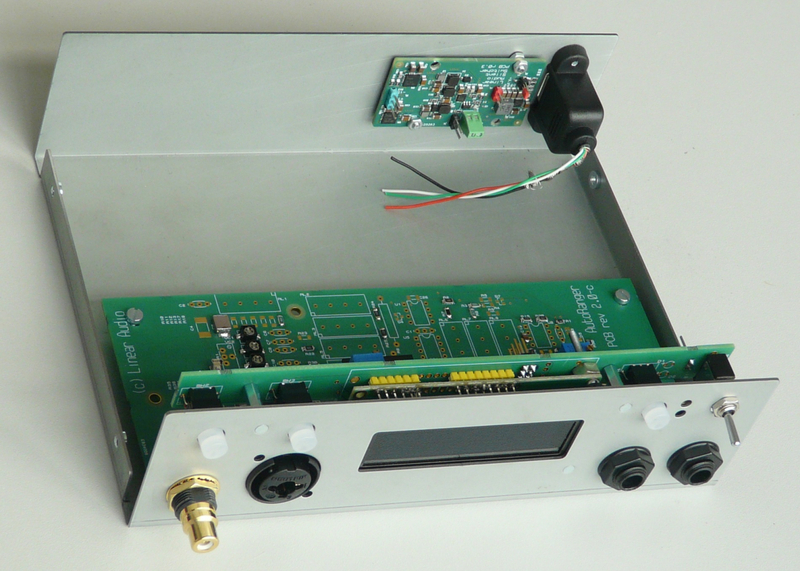 The AR is a separate small box (see pic) with a single-ended and balanced input that accepts the signal to be tested, and a single ended and balanced output to your soundcard. Simple and easy. But people don't like black boxes, so there's a small display that tells you what's going on: it shows the signal level going into the soundcard, it shows the signal level going into the AR, and the attenuation or gain that was applied to get these values. Then there's a pair of LEDs showing when the AR gets too large (more than 150VRM) or too small (less than 100mVRMS) an input to get it to 1V: the Overrange (red) and Underrange (green) indicators. Although the AR runs fully automatic, you can manipulate it through a trio of pushbuttons. Firstly, there are two pusbuttons to select either the single ended or the balanced input. Internal processing is a bit different for the two modes so selection allows optimal results in either mode. Secondly, if for instance you want to do some kind of level sweep, you can set the auto levelling at the highest level you expect and then press HOLD. This locks the attenuation or gain at the present setting until you release it with another press of HOLD. Finally, one more manipulation: if you are in HOLD mode, the input select pushbuttons take on a new role: by pressing one or the other, you can force the AR into a flat -20dB or -40dB setting, or return to the initial locked setting. I have tried to think of all circumstances for use and this gives you additional options (it is also used for calibration by the way). The AR accepts anything between 100V RMS (140V peak; yeah that's some amp you have there) and 150mV RMS. And as noted, puts it out levelled at around 1V RMS. The range goes from -40dB to +16dB in 4dB steps. The frequecy response is flat within +/ 0.2dB out to 100kHz so it is flat even with a 196kHz soundcard. Distorton is down to -120dB, also better than almost anything out there. 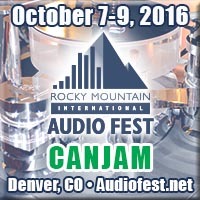 Input impedance is 100k in all attenuation and gain settings, within 1%. Input capacity is TBD but probably around 30pF in all settings. Good that you asked! I have develoed the power supply with the notion that it should be totally separate from the mains. Too many of thee setups are plagued with hum, niose and line harmonics that somehow always seem to sneak in through the mains. The PSU for the AR runs on nominal 5VDC input. 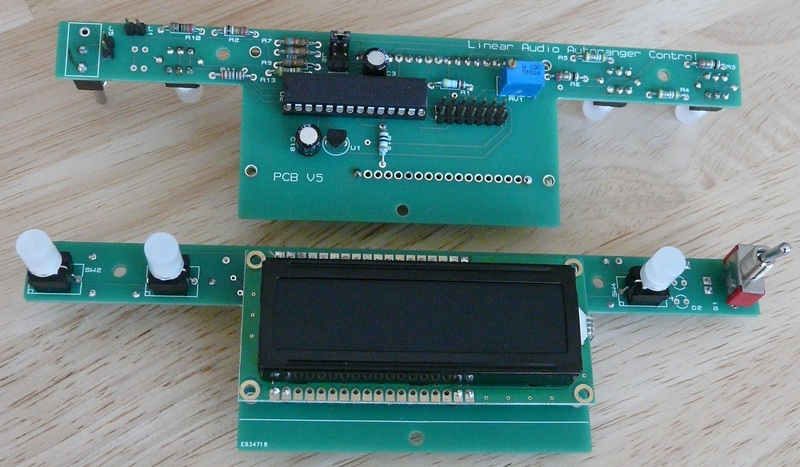 It can run on batteries from 3V to 10V, but the idea is to run it from a USB charger or a Power Bank (PB); it has a standard USB type B connector on the back). Of course, with a plug-in USB charger it is not strictly separated from the mains (although better than with a 'normal' power supply), but the PB option is ideal. You can dedicate a small PB to it and have it constantly on the charger, and for sensitive measurements (or for portabilty) you just unplug it from the charger. The power draw is small enough for many hours of operation even with a 2000mA PB*. *That power supply is really a problem solver and you can also use it for anything that needs both a very low noise +/-15DC supply and a 6V, 5V or 3.3V 'digital' supply. I call it the SilentSwitcher.